In Rajasthan, India, guar farmers are applying sustainable agricultural practices to improve their livelihoods. Highly versatile, guar is a drought-resistant legume that grows in arid areas while improving the soil. Guar gum produced from the seeds of the plant is used as a thickening agent in a wide range of food, cosmetic and industrial applications – from cattle feed and ice-cream, to hair-care products and fire retardants. Around 80 percent of the world supply of guar comes from India, produced mostly in Rajasthan state by farmers like Bhawarlal. 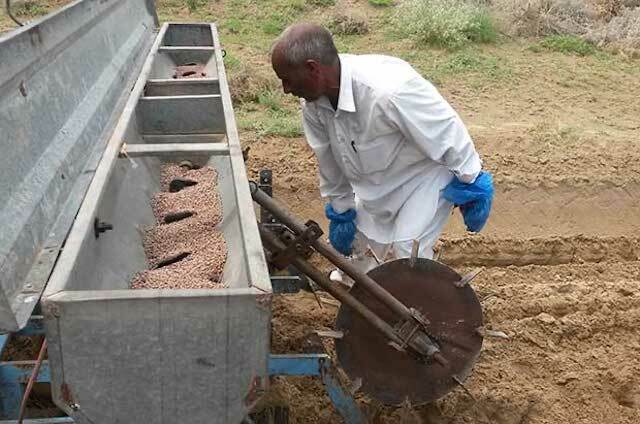 Since guar adds nitrogen to the soil and can be harvested three months after planting, Bharwarlal has grown guar as part of regular crop rotation on his farm in village Bamanwali for years. Yet he wasn’t convinced of its potential as a source of sustainable income until he joined the Sustainable Guar Initiative (SGI). I see the improvement in crop productivity after implementing the techniques taught by TechnoServe. Launched in April 2015, SGI is a partnership between TechnoServe, international chemical group Solvay, cosmetics and beauty products company L'Oréal, and Indian guar gum manufacturer Hichem. The program aims to promote best practices in rainfed guar cultivation and enhance farmer revenues by 25 percent over three years. SGI empowers farmers with tools and knowledge to cultivate guar through good agricultural practices, resulting in more continuous, high-yield production while protecting local resources. 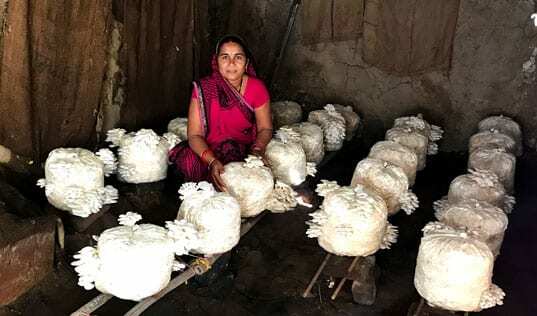 Currently, SGI is working with more than 2,500 guar farmers across Bikaner district, including nearly 500 women farmers. 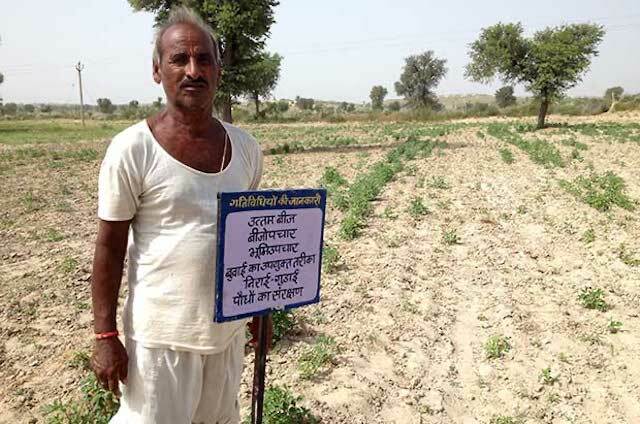 Bhawarlal, along with other farmers, volunteered to reserve an acre of his farmland to be used as a demonstration plot. “The demo farm will allow me to learn scientifically improved agricultural practices to enhance the yields of guar,” he said. His demo plot was set up in July 2015 and for the next three months, he attended training on guar cultivation, from seed selection to harvesting. In interactive sessions conducted by TechnoServe, Bhawarlal learned about land and seed treatment, line sowing, deep hoeing and pest management. The program does not use any chemicals and teaches farmers how to create organic repellent and fertilizer. Farmers can apply the practices taught in the training to other crops grown in the area, like moth bean. Though initially Bhawarlal was skeptical about the benefits of the package of practices, his confidence grew with mentoring and results. In early October 2015 he saw the benefits of improved guar cultivation firsthand: not only was the quality of the demo plot crop superior to the control plot crop, but the yield from the demo plot (107 kilograms) was over five times that of the control! In an epiphany, Bhawarlal realized that if he adopts improved practices, he can increase his farm income despite having limited land. For the 2016 season, he dedicated 10 acres of his farm to guar cultivation. “I believe that improved technology will improve my farm earnings. I see the improvement in crop productivity after implementing the techniques taught by TechnoServe. I am also encouraging other farmers from my village to adopt these practices,” Bhawarlal said. From skeptic to advocate, Bhawarlal is now a champion farmer in his village, showing other farmers how better practices lead to bigger yields. And as global demand for guar grows, Bhawarlal knows that better yields mean bigger profits.